It Is Not a "Tumah"
1Pulmonary and Critical Care Medicine, Drexel College of Medicine, Philadelphia, PA, United States, 2Pulmonary and Critical Care Medicine, Cancer Treatment Centers of America, Philadelphia, PA, United States, 3Interventional Pulmonary and Critical Care Medicine, Cancer Treatment Centers of America, Philadelphia, PA, United States. Case Presentation: A 55 yo F with a PMH of Stage IIB Invasive ductal carcinoma diagnosed in 2002 presented for evaluation of cough. Treatment included surgery, chemotherapy and radiation. Her course was complicated by metastatic recurrence to the bone and liver. 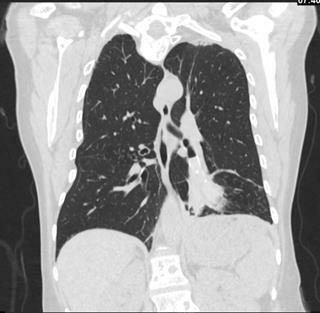 The patient then developed an insidious, progressively worsening, dry cough over 6 months. Significant physical exam findings were sinus tachycardia and decreased air entry at the left base. Laboratory work was only significant for 3.1 WBC with 48% eosinophilia and also an elevated but stable breast antigen CA 15-3. CT Chest was significant for bilateral lower lobe opacifications, left greater than right with surrounding tree-in-bud nodularity and a central airway obstruction at the left lower lobe with post-obstructive consolidation (Figure 1). Clinical Course: The patient was prescribed an inhaled corticosteroid as well as a course of Azithromycin. She completed the antibiotics with no improvement of cough and subsequently underwent a flexible bronchoscopy for further investigation. Complete endoluminal obliteration with thick mucinous material of the left lower lobe os was visualized and debulked using a cryoprobe. Pathology showed scant fragments of bronchial wall with marked chronic inflammation, abundant necrotic debris and fungal organisms consistent with Aspergillus sp. Culture results we positive for Pseudomonas Aeruginosa. She was treated with 14 days of Levaquin and Voriconazole, with clinical improvement. Discussion: Aspergillosis sp. is a common fungus in the environment that is typically inhaled and can cause either no disease or a variety of pulmonary disease syndromes. Patients who typically experience colonization from spores and disease from Aspergillus sp. are those with pre-existing lung disease or immunocompromised patients who have defects in mucociliary clearance, which remains preserved in normal hosts. One phenotypic presentation of Aspergillosis sp. seen in asthma and CF patients, albeit infrequently, is Allergic Bronchopulmonary Aspergillosis (ABPA). However there are case reports of ABPA in normal hosts. The diagnosis of ABPA is made clinically with no single test being diagnostic by itself. When encountering an endoluminal obstruction on imaging the differential would include either primary or metastatic cancer, diseases which cause mucous plugs radiographically described as “mucoid pseudotumor”, lipoid pneumonia, as well as exogenous inhalation of foreign objects. In our patient who had an atypical presentation and no history of atopy, metastatic disease was the primary differential diagnosis. The presence of mucoid impaction with Aspergillus sp. and eosinophilia lead to the diagnosis of ABPA.